This photograph shows the first British guard at Jaffa Gate when Jerusalem surrendered to the British in December 1917. 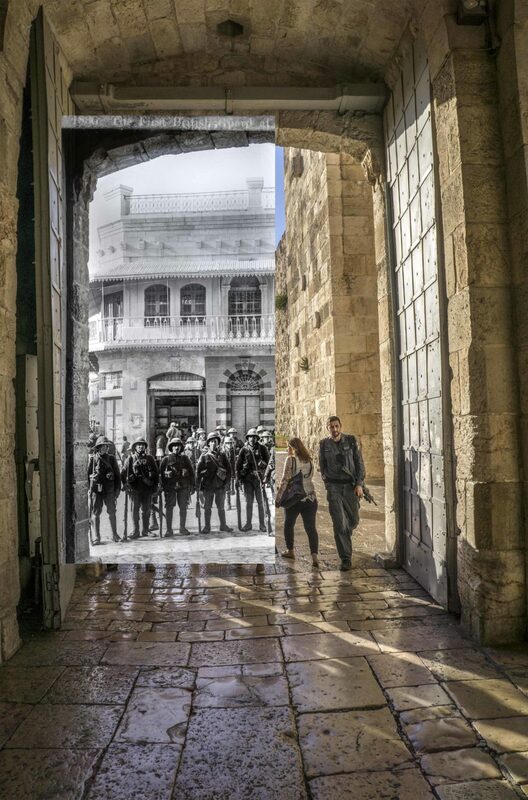 It is part of the One Hundred Years series that traces the changes to a single location in Jerusalem. Jerusalem’s landscape as we know it today is merely a surface layer, a slice in a long tumultuous history that has continuously seen people and civilizations taking over from preceding ones. Over time, layers are obscured and sometimes obliterated to the point where one can find only a few traces or ruins. Superimposing an additional layer, a photograph taken today of the same location, onto that taken by the American Colony photographers some hundred years ago, shot from the same spot and the same angle, moves us between two distinct periods of time. It allows us to study the changes that have occurred, make comparisons, and align the physical transformations with the events that took place in the city and around the region during the last century. Born and living in Jerusalem. Founder and director of Anadiel Gallery and the Al-Ma’mal Foundation for Contemporary Art in Jerusalem.